St. Paul teachers support Los Angeles teacher strike. Do you? A couple dozen St. Paul teachers participated in a “walk-in” before school Tuesday morning to support the Los Angeles teachers’ strike that has made national headlines. As reported by KARE 11, the group demonstrated outside Highland Park Middle School before class started to let teachers from Los Angeles know they “stand in solidarity” with them. The history of teacher strikes began with St. Paul teachers in 1946. 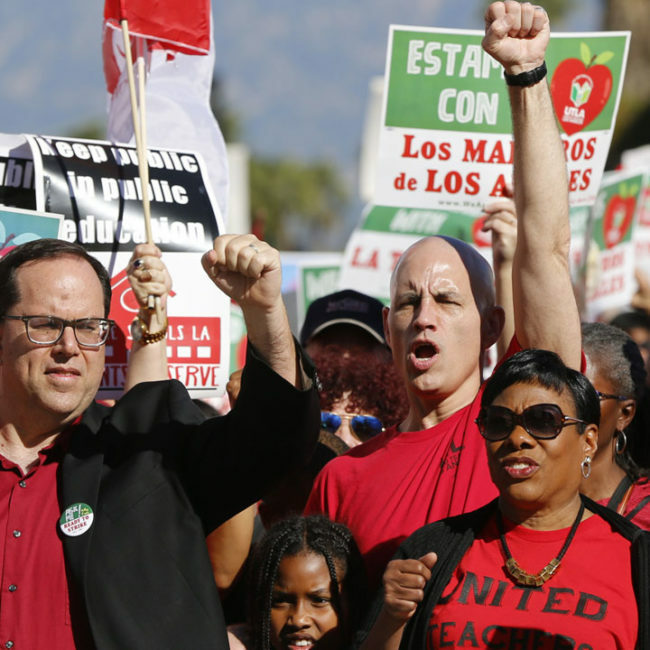 Nearly 90 percent of the city’s educators voted “yes” to engage in the first organized teachers’ strike in the nation. That strike was illegal in Minnesota, and would be for another three decades until an amendment was added to the state’s Public Employee Labor Relations Act (PELRA). Teachers who participated in the 1946 strike risked losing their tenure rights, state teaching certificates and could have been subject to discharge. According to the Center’s Thinking Minnesota Poll, Minnesotans believe teachers should have the right to go on strike (80 percent). Only 12 states, including California and Minnesota, allow teachers to strike. But as we saw last year, making teachers’ strikes illegal doesn’t stop them—teachers went on strike in Arizona, Kentucky, Oklahoma and West Virginia despite strikes being against state law (to work around this they were called “walkouts”). So, aside from the legality of striking, because teachers will strike whether they have the legal right to do so or not, is it in the best interests of everyone involved? Does it help create sound policy changes? Does it elevate teaching as a profession?